I have been making Easy Christmas Saltine Toffee Recipe for years. My sister originally introduced it to me and the other day I thought why should this amazing toffee only be made once a year. Yes I understand that you crave something more the less you have it. My solution for this is that I would make the saltine toffee base the same but mix things up with the chocolate toppings. Instead of semi-sweet and butterscotch chips I would use white and red chips. 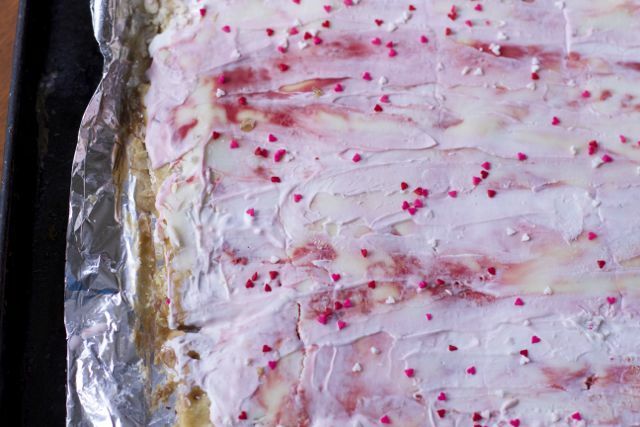 Either way we call this dessert crack because you can not eat just one. I had fun making this for Valentine’s Day and already starting to think what I can make for St. Patrick’s day and Easter. 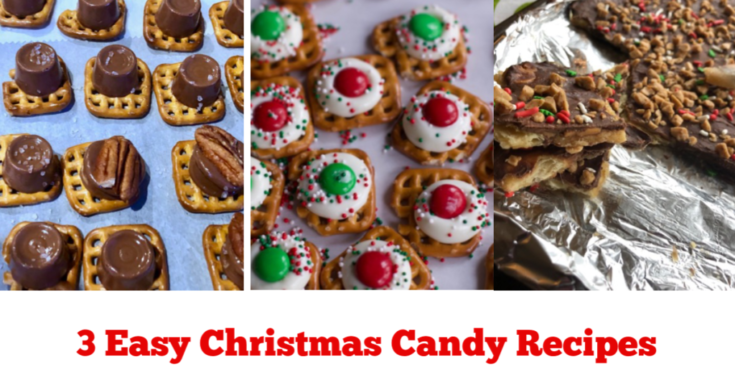 Perhaps I will make the pretzel toffee recipe I have made a few years ago to mix things up. 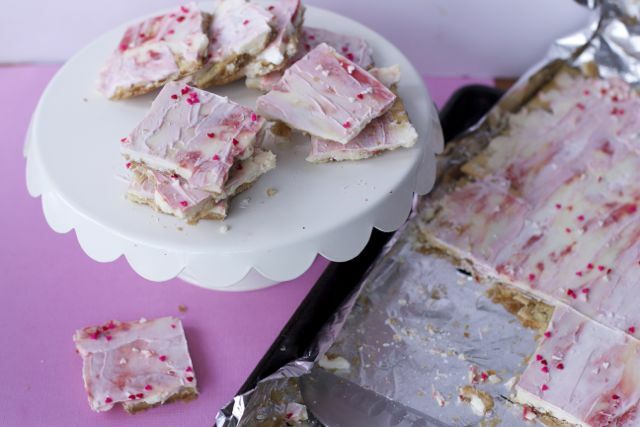 Either way hope you enjoy this recipe and get creative with your easy toffee recipe. This is such an easy toffee recipe that does not require a candy thermometer like regular toffee recipe. 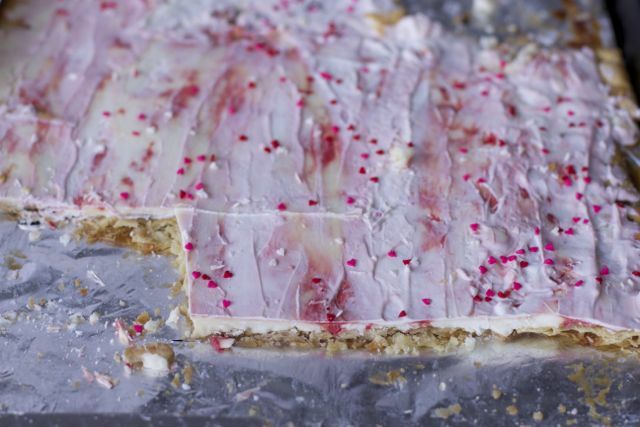 You only need a few ingredients and a little imagination. Ok maybe not imagination just willing to experiment with flavor combinations. Start by layering a sheet pan with saltine crackers. I have tried whole wheat and unsalted, you need to go with the traditional saltine crackers. Melt butter and sugar until bubbly. Don’t walk away, you don’t want to burn this or you will have to start over. 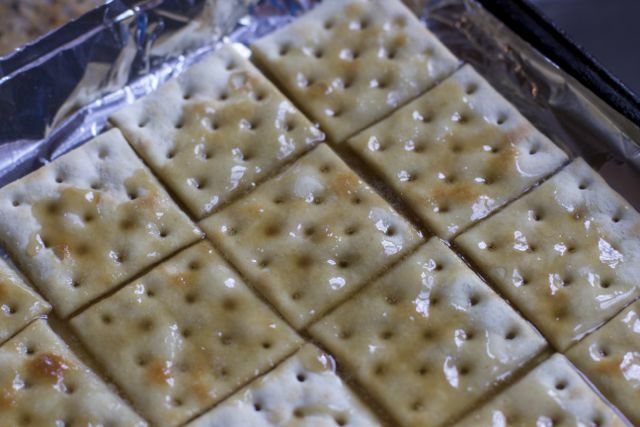 Pour evenly over the crackers and bake for 5 minutes. Add a few red chips and spread the mixture to get a marble affect. 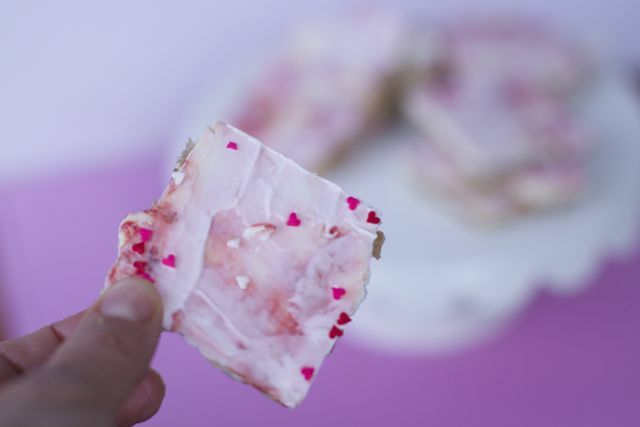 Top with festive sprinkles if you desire and allow the saltine bark to set completely. Either break or cut the easy saltine toffee recipe into serving sizes. This was an easy dessert that I am sure will be a keeper in your home. 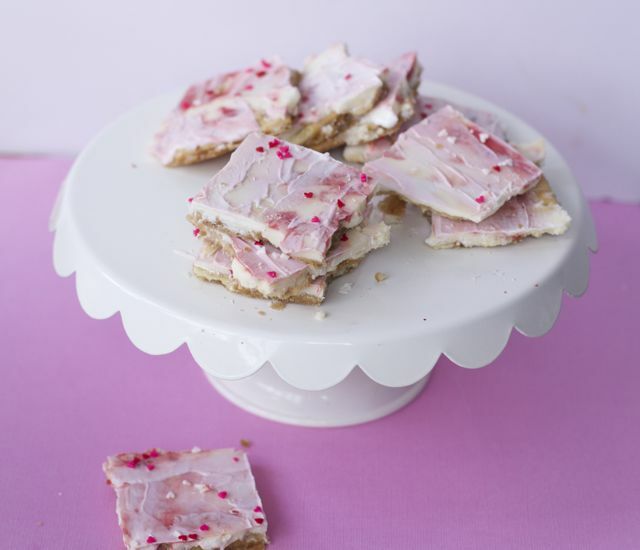 Bet you can’t eat just one of these sweet saltine toffee pieces. Melt the butter and the brown sugar in a heavy bottomed pan, and let boil for 4 minutes. Meanwhile, line a jelly roll or cookie sheet with tin foil and spray with non-stick cooking spray. 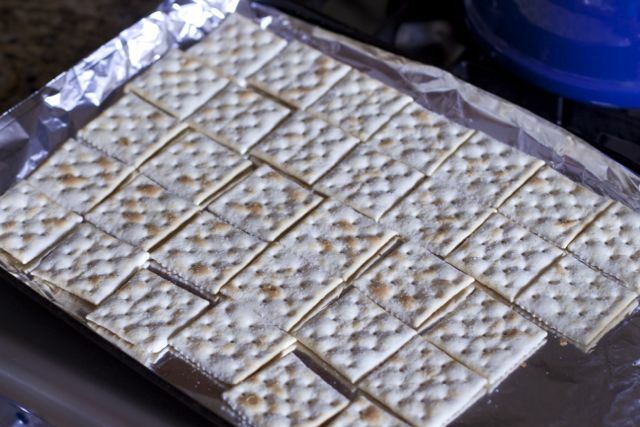 Line the crackers closely together on the pan. Evenly pour the butter/sugar mixture over the crackers being careful to cover most of the crackers. Put the pan into the oven for 5 minutes. 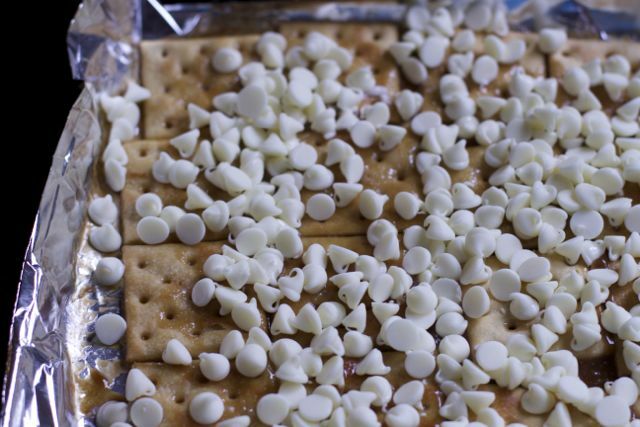 Smooth the melted chips among the saltine crackers, covering the entire sheet. Sprinkle with desired toppings and press into the melted chocolate slightly. Place entire pan in the fridge until hardened. Once hardened, peel off the tin foil and break into desired size pieces. 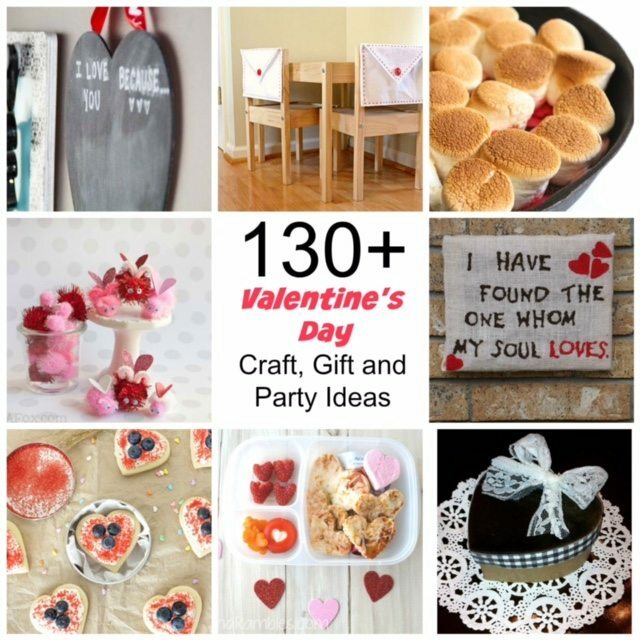 Still looking for Valentine’s Day Ideas: Be sure to check out these 130 amazing Valentine’s Day Recipes and Valentines Day Crafts from some amazing bloggers. This looks like a fun recipe the kids can help make. We’ll have to give this a try for Valentines day. My daughter is begging to make a valentine sweet. This one looks easy enough to let her help with! Thanks! Candy crack is right!!! 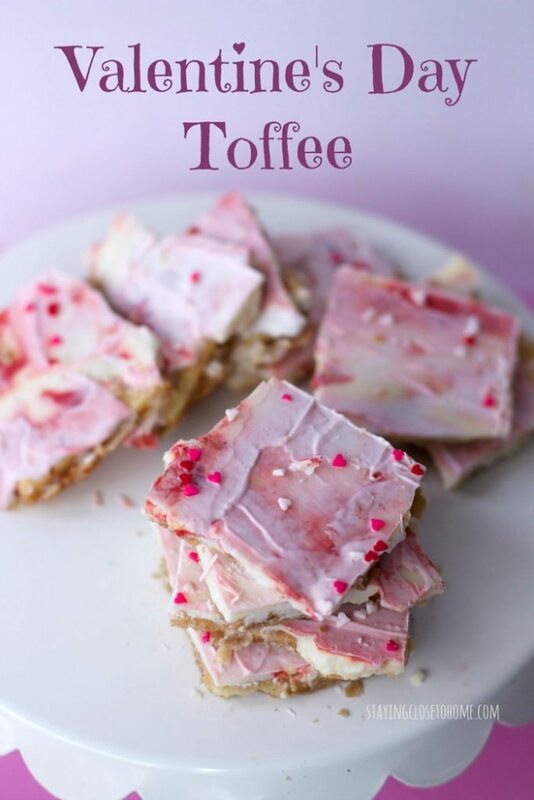 I would be very intimidated to try a traditional toffee recipe but I would definitely try this. Starting with saltines is so smart. I made this recipe for Christmas but I never thought to use White Choocolate. This looks so festive for Valentines Day!! And that treat is soooo good!!! This is such a neat recipe. I’ve never made anything like this before. I bet that salt and crunch from the crackers is wonderful! Wow, I never thought of the red and white chips for the pink effect! 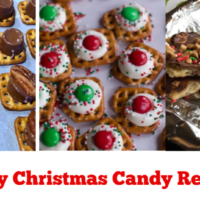 Saltine toffee is one of our favorites and the girls will love making this!! !